Here's a pathetic Christmas display in Guilfoyle Park, Double Bay. In past years a large Christmas tree was featured but now it would appear the Chamber of Commerce and Woollahra Council have decreed the tree passé. That Double Bay now feels like a ghost town, thanks largely to Westfields Bondi Junction and its easy parking, is not helped by installing a koala in drag to celebrate Christmas. No class. That's deliciously bad. I love it. Here in the U.S., that would be considered high art. I don't see anything particularly offensive about it, but it doesn't exactly scream "Christmas" either. I think it's kind of cute, too. 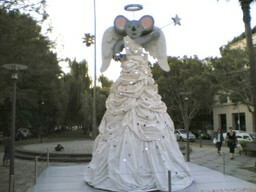 You mean: koala in strapped into a bad wedding dress doing the hot-shoe shuffle! Oh dear, that's tragic. I much prefer the tree in Martin Place or the QVB.